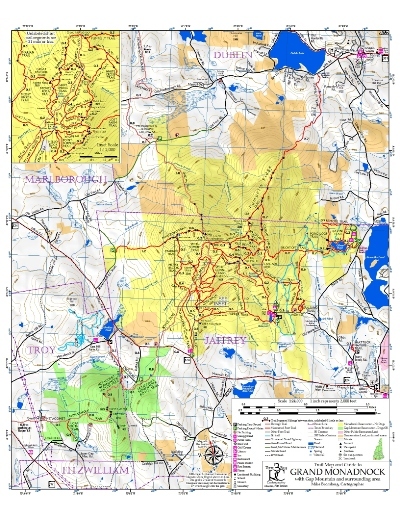 Trail Map & Guide to Grand Monadnock, by Three Ring Cartography, 2010. Created by Mike Bromberg, who also made the WODC Map of the Sandwich Range, this colorful Tyvek map shows all of the myriad hiking trails on Mt. Monadnock and also includes nearby Gap Mtn. Scale is 1:24,000 with 50-ft. contour intervals, plus 1:12,000 scale inset map of Halfway House area trails. Mileages between points shown on trails, along with viewpoints and natural and historical features. Also shows ski trails, all roads, and parking areas. Reverse side has descriptions with mileage logs for all hiking trails on map, plus general park and hiking info. Folded to pocket-size (3 1/2" x 6 1/2") and comes in Tyvek envelope.